Predicting the final temperature of a part is not always an easy thing to do. It becomes a complex task for complex parts. 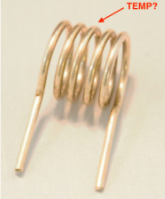 We’re going to predict this final temperature for something simple, like an air coil inductor. The mathematics found can “loosely” be applied to more complicated parts but certainly the approach can be applied to more complex parts. Here we’ll take the thermal conductivity to be that of air because we are going to assume that given the very short distance above the wire we wish to predict the temperature at that this boundary temperature is better predicted by using conduction math instead of convection math. Predicting this temperature using convective heat transfer is less accurate due to the unknown and varying values of heat transfer coefficients, as well as the different surface areas presented by the many different forms. The short distance of one wire radius above the wire surface I have found makes the following method fairly accurate when I compare the math with actual measurements. Now we defined earlier that Q was the heat flow per unit time… this is energy per unit time and energy per unit time is power. We will assume that the heat energy being generated per unit time is due to I2R, or electrical power loss. This is the circumference of the wire multiplied by it’s entire length… it is the surface area of all the wire used. I measure with a thermocouple about 37.3˚, for a percent difference of about 1.35%. This whole analysis applies to coils with an air core, of a single layer whose individual turns have a bit of space between them as the prediction was made assuming all the wire of every turn has a surface area that heat can move out into air from. As soon as the turns are set closely adjacent to each other the surface area is reduced and the actual temperature will be higher. If the turns are wound on more than one layer then surface area is reduced and the actual temperature will be higher. If a core other than air is used it will have a thermal conductivity other than air and heat will move into it likely more easily than into the air, reducing temperature. Heat energy is energy and it is conserved – hold it back in one place and it will simply work harder getting into other places – let it move more freely into one place and it will simply work less at getting into other places. There are many factors to consider but this final result should give you a formula you can use “loosely” with more complicated parts and part structures but the approach will still be valid if applied to more complex structures/forms. That approach being analyzing the flow of heat and the temperature differences seen due to the interaction of this heat flow and the thermal resistances it comes into contact with.